Spain’s Metropol Parasol structure a knock-out! Having just been bowled over by the 6-photo slideshow of Seville, Spain’s new Metropol Parasol, I want to be certain you’ve snagged a peek at the new and creative architectural marvel, if you haven’t. Since its completion in April 2011, we now know where to find the ‘world’s largest wooden urban structure’ and it is a show-stopping beauty of a sculptured building of cross-hatched wood over steel in the most graceful of forms. And the Parasol has practical uses for city dwellers and tourists of Seville as Uranian genius pours into Saturnian form! Plato’s Ideal? Seems very close to me but really you should decide for yourself. And please don’t be dissuaded from taking a peek at the photos by the fact that ‘parasol’, ‘rain’, and ‘rain man’ are related symbols of the sort of largess that tends to come with too many strings attached. No, let’s not go there. But do let us run away to Seville to bask under the Metropol Parasol! 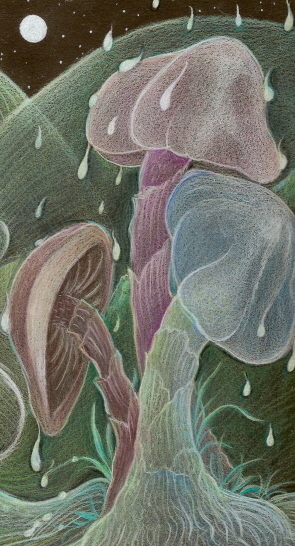 A fuller view of my drawing ‘Shroom Trio may be found in the current ‘Mad Majicks’ issue of Emerging Visions e-zine and you’re cordially invited to check out all the Art and Poetry!